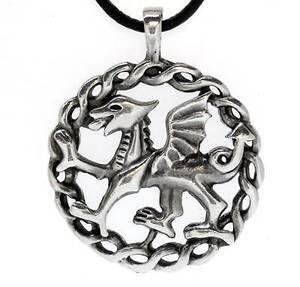 This classic Red Dragon of Wales is handcast and hand-finished in solid American Pewter with a shiny finish resembling antiqued sterling silver. 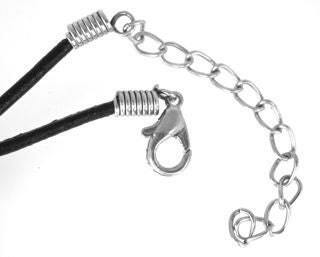 The Welsh Dragon is on an 18" leather cord with a lobster clasp and 2" extension chain, or you can request one of our additional necklace options. The Red Dragon of Wales is the symbol on the Welsh Flag. The flag is also called "Y Ddraig Goch." The oldest recorded use of the dragon to symbolize Wales is from the Historia Brittonum, written around 829 AD, but it is popularly believed to have been the battle standard of King Arthur and other ancient Celtic leaders.